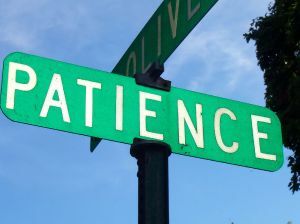 When I was at the Austin Film Festival this past October, I kept hearing fellow filmmakers tell us newbies that we needed to learn patience. Our first scripts probably wouldn't be the ones to sell, and it takes 6-10 years to make it in the industry. "Just be patient," we were told. I probably heard those statements in various forms about 20 times over the 9 day festival. As a former primary school teacher, I like to think I can be patient. Key word: can. It doesn't mean I like to be. In fact, I think that's why I enjoyed teaching in primary schools - those kids move fast! I had to move faster than the kids, keeping one step ahead of them at all times, particularly in inner city schools in London, England - or else fights would break out, kids would be hurt and I'd ultimately feel like a really rubbish teacher (like my use of "rubbish" there? Oh, the British! I love them so). But now, I'm making movies. And let me tell ya - it takes a whole lot of time to go from point A to point B in the movie world. And we're moving ridiculously fast according to our film-making friends who have already made their first features. Apparently, it takes at least a year to go from script to final movie. We're doing it in 6 months. Jen, the writer/director in our sister-filmmaking team is much more patient than I am. She's already written 12 scripts, had a bunch of options and a Praxis contest win, and she manages to write while her 3 kids are running around the house around her. I'm not even kidding. I call it the circus over there. Our website's not done yet, so we're holding off on the kickstarter launch until it is. Any day now folks! At least the teaser is out there and getting loads of great reviews & retweets on twitter. Now, my patience is being tested as I click "refresh" a gazillion times a day to see how many people have seen it. I hope to reach a level where I stop refreshing. If you haven't seen it yet, here it is. Also, if you have any tips or tricks for learning to be more patient - send them my way. I need all the advice I can get!